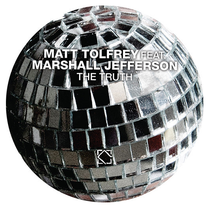 ‘The Truth (Feat Marshall Jefferson)’, one of the standout tracks from Matt Tolfrey’s debut LP, ‘Word Of Mouth’, sees a full single release with additional remixes from Gerd’s Geeeman project and John Charnis. Leftroom boss, Tolfrey, dropped his ‘Word Of Mouth’ LP late in 2012 and the project served as an insight into the influences and passions of the DJ/producer. ‘The Truth’ was a particular highlight for both listener and producer alike as it featured the vocals of one of the ‘godfathers of house’, Marshal Jefferson. Tolfrey’s original version opens the package with a strident simplicity. Bare bones house with classic influences distilled in to a contemporary slice of 4/4. LA-based producer Jon Charnis, an artist who has remixed work for Innervisions and No.19, turns in a moody late-night interpretation that drops Jefferson’s vocal input in favour of steadily building melodies. Dutch 4Lux boss, Gerd, dons his Geeeman for two versions which take on a rough-edged, brutalist house sensibility. Saturated Juno licks and 909 stomp form the backbone of both mixes but the ‘Deep Vox Voyage’ showcases rich chords and Marshall Jefferson while his ‘Rough Mix’ takes things even grittier. Check it out below, it’s out 21 October.